Our YZS series and YZL series palm kernel oil presses are advanced oil expellers, characterized by their high oil output rate, good quality, simple design, easy and continuous operation. 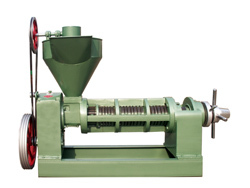 Our palm kernel oil press is composed of feeder, gearbox, pressing cage, screw shaft ,and machine stand etc. It has better results to press palm kernels. It utilizes the screw shaft that is set-up with different styles of screws and rotates when machine is running to push the material into chamber. Then the palm kernel oil is separated out through the extrusion of pressing worm and pressing ring. 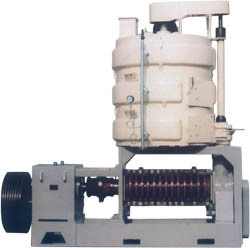 Our large palm kernel oil presses have large capacity which mostly used in middle-large scale oil plant. They can be divided into two kinds: One is hot processing, which includes steam cooker and oil press. The steam cooker is used for oilseeds pretreatment before pressing. The other is the cold processing. The advantage of this kind of machine is lower temperature when press the seeds. It is about 80 degree, which can protect the nutrition element in the oil. This palm kernel oil press includes large capacity, high oil output, low oil residual, light processed fats color, good quality, rich nutrient. Palm kernel oil is an oil which is extracted from the seeds of the oil palm, a tree native to Africa and widely cultivated in Africa and parts of Asia. The fruit which surrounds the seed can also be pressed for oil. Depending on where one lives, it may be easy or difficult to obtain pure palm-kernel oil, but products which contain this oil are often abundantly available. Splitting of oils and fats by hydrolysis, or under basic conditions saponification, yields fatty acids, with glycerin (glycerol) as a byproduct. The split-off fatty acids are a mixture ranging from C4 to C18, depending on the type of oil/fat. Resembling coconut oil, palm kernel oil is packed with myristic and lauric fatty acids and therefore suitable for the manufacture of soaps, washing powders and personal care products. Lauric acid is very important in soap making. A good soap must contain at least 15 per cent laurate for quick lathering while soap made for use in sea water is based on virtually 100 per cent laurate. Derivatives of palmitic acid were used in combination with naphtha during World War II to produce napalm (aluminum naphthenate and aluminum palmitate). 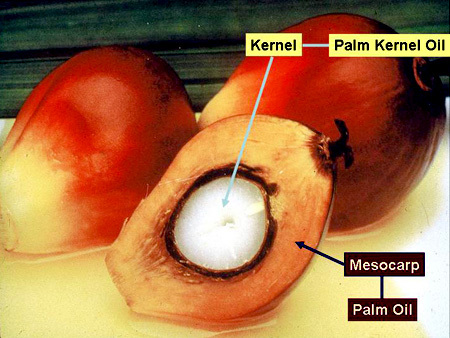 Palm is also used to make biodiesel, as either a simply-processed palm kernel oil mixed with petrodiesel, or processed through transesterification to create a palm kernel oil methyl ester blend, which meets the international EN 14214 specification, with glycerin as a byproduct. The actual process used to make biodiesel around the world varies between countries, and the requirements of different export markets. Next-generation biofuel production processes are also being tested in relatively small trial quantities. According to Hamburg-based Oil World trade journal, in 2008, global production of oils and fats stood at 160 million tonnes. Palm kernel oil and palm oil were jointly the largest contributor, accounting for 48 million tonnes or 30% of the total output. Soybean oil came in second with 37 million tonnes (23%). About 38% of the oils and fats produced in the world were shipped across oceans. Of the 60.3 million tonnes of oils and fats exported around the world, palm oil and palm kernel oil make up close to 60%; Malaysia, with 45% of the market share, dominates the palm oil trade.